In 12-inch skillet, heat oil over medium-high heat. Cook ribs in oil (in batches if necessary) 8 to 10 minutes, turning occasionally, until brown on all sides. Spray 5- to 6-quart slow cooker with cooking spray. In slow cooker, place onion and ribs. Cover; cook on Low heat setting 4 hours 30 minutes to 5 hours 30 minutes. In 2-quart saucepan, cook remaining ingredients over medium heat 15 to 20 minutes, stirring frequently, until sauce has thickened. Drain excess liquid from slow cooker. 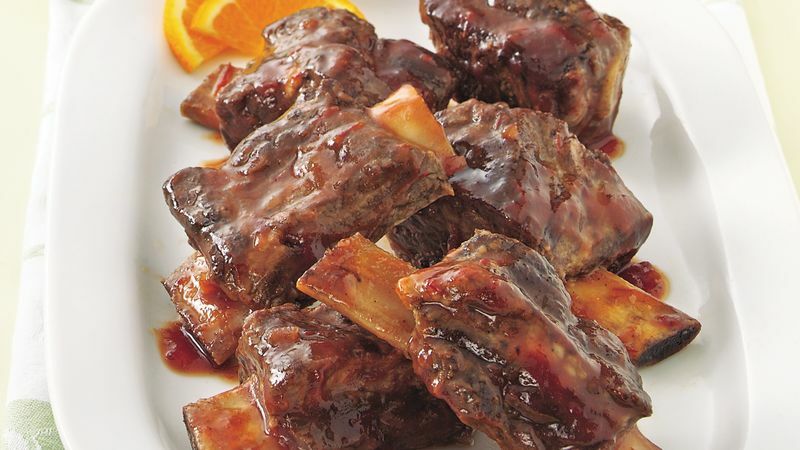 Pour sauce over ribs. Increase heat setting to High. Cover; cook 25 to 35 minutes longer or until hot.